This is one look which has been there in my mind for ages, but never did as it requires hell lotta patience and time, at least I like to take time and do such looks. Today as I took off from work, I decided to take advantage of a holiday and do the look. This is my first attempt at this kind of dramatic cut crease look. I know its not a very crisp & neat cut crease. This post is not to show how well I can do it, but how I can improve from here. So, I need your valuable suggestions to improvise further. Step 2: Draw a line like shown below using a black eye pencil. I have chosen MAC Chromographic pencil, because it formula is very soft and easily blends/ smudges. When tracking in the crease, make it parallel to your brows. Smothen and smudge that line like shown using an angled brush. Apply MAC Indian Ink eyeshadow using a pencil brush on the black portion as shown below. I used MAC 219 brush. Now is the time for lower lash line. I traced the same MAC Chromographic pencil and smoothened the lined using the same angled brush. Then I applied MAC Indian Ink eyeshadow and blended it using MAC Shockaholic eyeshadow. 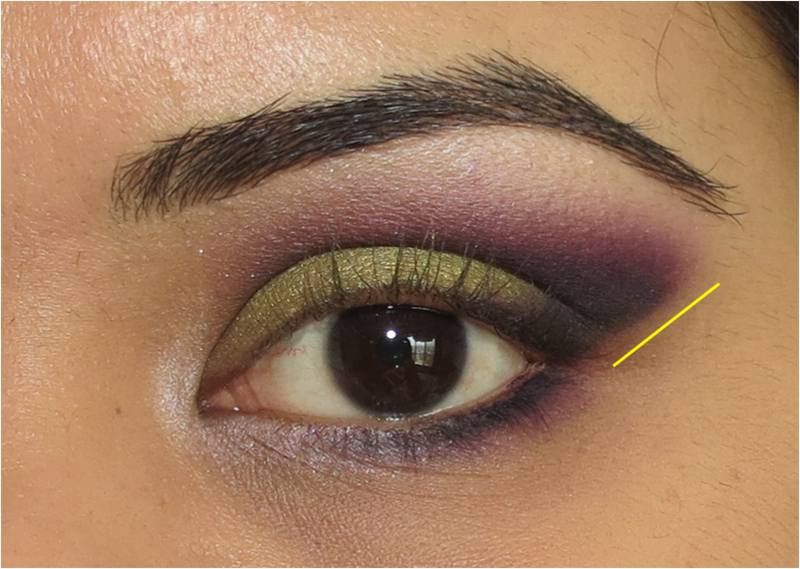 Also, applied MAC Sweet Lust eyeshadow in the inner third and blended it in the purple. 2. I shouldn't have blended the Shockaholic eyeshadow under the lower lash line? I then finished the look with a jet black pencil in the inner rims of my eyes and 3 coats of Maybelline falsies mascara and set the brows in place using MAC Clear Brow Gel. I have used Inglot Water Proof kohl in inner rims, as it is jet black and doesn't smudge or move from its place. Here are some more pictures of the look. But before that, I need your suggestions on the cheek and lips combo as well. I used a peachy pink blush as I thought it will complement the purple & green well and would not be over powering and same peachy pink shade on the lips mixing a peach lipstick and pink lip gloss. As you all know that this is my first attempt at the cut crease eye make-up with little knowledge that I have. Looking forward to see your suggestions in the comments below to improve further and also some new techniques to do a cut crease and blush and lip combination to pair with such dramatic looks. which inglot kohl have u used? have u reviewed it? You do great makeup - for your next cut crease, would love to see a different ""cut"! This looks stunning...being a makeup newbie that's all I can say! Shockaholic looks like a must-buy...is it permanent? this looks stunning!! thee colors you've used are to die for! Awesome color combination! Thank you so much Deepika. Yeah, Shockaholic is a very pretty shade. Sad that it's a Limited Edition shade.